Affordable DJs For Kids' Birthday Parties, Kids' Karaoke, Bar / Bat Mitzvah, School Dances, Fund Raisers & Community Events in Orlando & Central Florida. Music Mania Events DJ & Karaoke service brings budget friendly DJs and the party music to your location! Featured is a kids birthday party... proving you can have a blast with a few friends and the right DJ. Serving Orlando and Central Florida with budget friendly prices and experienced entertainers. 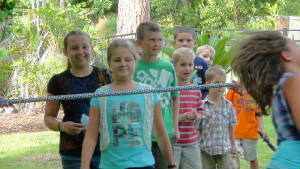 Call 407-792-4631 for your next Kids Party! Click here to get your Stress Free Kids Party Quote! 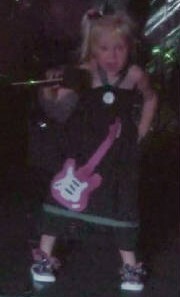 Outdoor parties with cool fun Rock Star! It's never too early to start . .
C'mon Ride The Train. . .
Each birthday party is unique - Just like YOU! From DJ Music that Rocks to interactive games and contests, Music Mania Events is playing your tune! • DJ that plays kid friendly music and YOUR Requests. • Karaoke: current songs and Party Songs kids are familiar with - lyrics are shown on our screen, tracks are great and you'll sound like a pro with our professional microphones, sound board and speakers! Sing solo or in a group. • Group Dances: like Cupid Shuffle, Gangnam Style, Cha Cha Slide, The Wobble, Watch Me Whip, Macarena, YMCA, Electric Slide, Conga, Wop, Chicken Dance, Hokey Pokey, Soulja Boy, C'mon and Ride the Train, Freeze Dance and more.... Choose the ones you like! 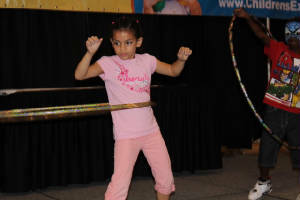 • Contests & Games: Limbo, Dance Contests, Hoola Hoop, Musical Chairs (or hats), Guess the song, and more. . .
• Video Recording: You can choose to have DVDs made as favors for your guests, or just get one for yourself. • Lights and Fog - add some color to your evening or indoor party! 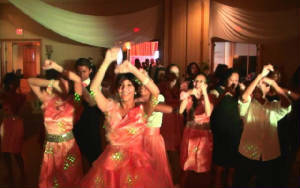 Motion and strobe lights dance and flash to keep your guests moving! • Kids Birthday Party Special: 2 hours of non-stop music and fun includes DJ, Party Host, Interactive dances and games, Karaoke and Live Projection to TV!!! • Birthday Party Basic Package: 90 minutes of non-stop music and fun includes DJ, Party Host, Interactive dances and games at a great price!!! • Do you have a special theme in mind? Call us at 407-792-4631 or click here to reserve your DJ and we'll add the excitement! Our DJs will keep them busy the entire time! We set up 1 - 2 hours in advance of our start time (no charge for set up) and start out strong with games like the Limbo, Hula Hoop contest, Freeze Dance, Lip Sync Contests, and so many more fun games. Line dances like The Whip, Cupid Shuffle, Cha Cha Slide, Gangnam Style, Hit The Quan and more will keep the party going. 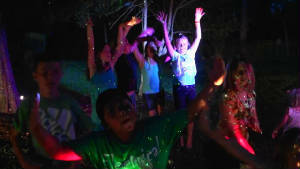 Modified Karaoke and Live Projection give the kids a chance to "see themselves on TV" while they sing and dance. to see themselves while dancing, games and contests. Interactive DJ, games, and contests. Call Music Mania Events at 407-792-4631 in Orlando for a birthday party DJ, party games, karaoke, teen party, preteen party, or birthday entertainment. Games and Contest Ideas for Your Party! Here are a few ideas for keeping your guests involved in your party. You will be able to choose some age-appropriate contests that are easy to follow. The best way to have contests at a party for kids, Tweens or Teens is to have a lot of inexpensive prizes so the games are fast paced and many people can win! Keep the size of the party area in mind when selecting a game or contest. Here's a chance to have a lot of happy winners at your party. . .
DJ picks a song and divides everyone into groups (usually between 4-8 per group) Contestants try their best to lip sync and dance. DJ or members of your group will judge. Winners can be awarded for Best Overall Performance, Most Creative, Most Energy, or another category that applies. Most parties like to do this contest twice! Form a straight line. When the music stops, anyone who has a bubble raises their hand and takes one step forward . Hoola Hoop Game Everyone stands in a circle. 3 seconds to guess or guess the wrong song, the next person in line will try…. Etc… To keep this game moving along, it's best to have enough prizes to award to a number of people. It's a quick game, because only a second of music is played before they start guessing. From Pre-School up to Adults like this game. 2 adult volunteers to be banana throwers/catchers. Adult throws one bean bag banana to first in line, who tries to throw it in monkey's mouth. If it goes in its a point for that team. Both teams do this at the same time. DJ calls out the points for each team, as they score. When the song ends, the team with the most points wins. If there are enough prizes for everyone on the team they all get a prize. The Prize Everyone stands in a circle. Kids will Pass around a small prize while the music is playing. When the music stops, the person with the prize keeps it. Musical Chairs Everyone knows how to do this. Line up two rows of chairs back to back. you will need to have enough room for the chairs, and have the chairs too! Freeze Dance When the music starts - everyone begins dancing. When the music Stops - everyone freezes. If you don't stop, you're out. In large groups, instead of being "out" we have the ones who 'just can't freeze' move to one side so they can keep dancing till the game is over. The winner gets a prize. Usually just one prize is needed. Have the kid who can swim stand around the edge of the pool with their toes over the edge. Make sure they are not standing over stairs or anything they shouldn't jump on. Arms length between them. Music Starts - everyone dances. When the music stops they jump in. Last person in stays in - everyone else gets out - repeat until there is a winner . Usually just one prize is needed. For large groups, to keep the party moving along, there could be more winners. At least one balloon per person, (& a few extras in case they pop before the game starts) already blown up (not too full) with elastic or string tied to it. Be sure they all take off shoes!!! Each person ties a balloon to their right ankle. When the music starts, they use their left foot to "stomp" on the balloon of the person next to them, until it pops. This continues until there is a winner. The excitement of the competition is the fun part, The prizes are incidental so they don't need to be expensive. Some parties have a couple Big Prizes instead of all the small prizes. If that appeals to your group, then the contests become "games" and the winner gets "Bragging Rights". It's all in good fun!